A day after the rain. It was February 19th when it rained in the morning, but it stopped in the afternoon in the city of San Lorenzo, Paraguay. I went to the back of the Museum of National History where I work as a volunteer, with a dropper and plastic Petri dish in hand. I began to collect water samples; it wasn't the first time I'd done that. So I returned to the museum and put it with my other water samples I already had. It was not until the next day that I started to study the water I collected the day before. The first thing I noticed were bacteria swimming rapidly; that wasn't a surprise. 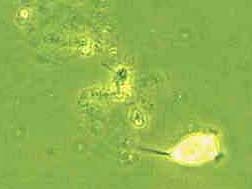 But suddenly there it was, at first I thought it was some kind of rotifer. I was very wrong, but with the help of the chief of the Invertebrate Department we figured it was Vorticella. At first I wasn't sure of it, I had never seen it before under the microscope. So I started to verify my suspicions with the second edition of 'How To Know The Protozoa' by Theodore Jahn, Eugene Bovee and Frances Jahn. Although I must say the key I used to identify it might not be the latest version. I used a phase contrast condenser and an Olympus photomicrographic system (Model PM - AK) to take photographs. In some of the pictures I took, I used a special filter that came with the phase contrast condenser and special objectives. However many of the pictures were out of focus. 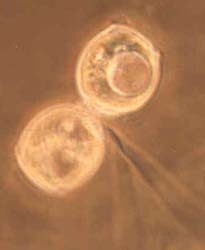 I attempted to take pictures when the Vorticella were separated from their stalks. I suspect that the ones I saw were Vorticella microstoma, however I'm not quite sure. 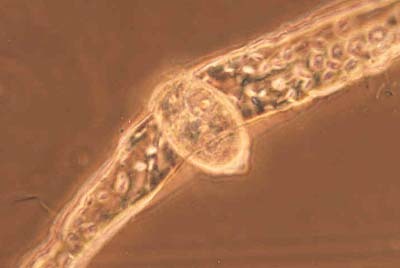 The same Vorticella but at 100x optical magnification. 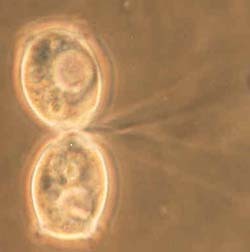 Two Vorticella, I must add that each one had their own stalk. With the above two Vorticella I attempted to take pictures of the formation of the posterior ring of cilia, although the image didn't turn out very well. It was interesting to study these two though. At first it appeared that the anterior end altered its shape, becoming more round in shape, and then suddenly the posterior ring of cilia became visible. Then it started moving very erratically, it reminded me of a mad dog trying to bite someone but couldn't because it had its leash on. The movement got faster and faster, creating tension, trying to separate itself from the stalk. After a few moments of struggle it succeeded, then it was still for a few seconds and then went fast like a bullet with the posterior end (with its cilia) leading the way. 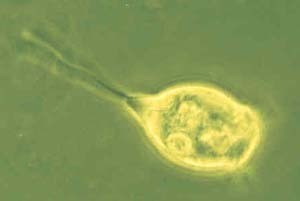 A Vorticella microstoma that has separated from the stalk and stopped at some debris. However, the posterior ring of cilia can't be seen (unfortunately) in this picture. Comments to the author Comments to the author sent via our contacts page quoting page url plus : ('dkamada','')">Daigo Kamada are welcomed. Published in the March 2002 edition of Micscape Magazine.